We are super thrilled to announce that our *Award Winning* Cold Pressed Watermelon Juice and Honeydew Melon Juice are now available at selected Sainsbury’s stores across the UK. Click through to see your nearest Sainsbury’s. Introducing the newest member of our melon family – the not so well known and that little more elusive to find…. green honeydew melon. With everything you would expect from a green juice, essential vitamins, minerals and super antioxidants that promote a strong and healthy body… minus the taste of grass (YAY!). The girls have done it! 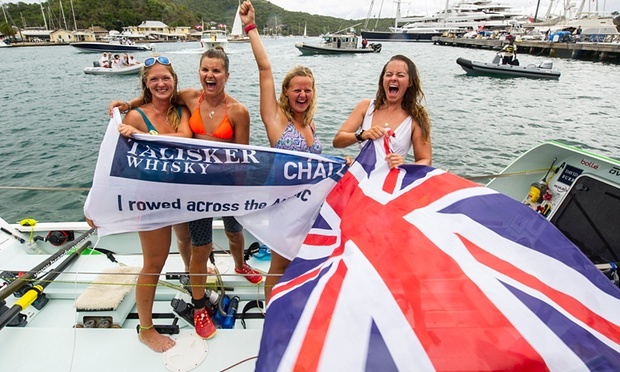 2,700 nautical miles across the Atlantic unaided in just 40 days! Powering through in second place to a victorious reception in Antigua on Friday night. After leaving the Canary Islands on the 20th December, the girls have become the fastest and youngest all female team to row the Atlantic. The chances are you are likely to come down with a cold this winter. According to the national health stats, the average person will catch 2 -3 colds per year and account for over 25 million days off work as a result. That’s a lot of catching up to do! A regular workout is one of the best things we can do to keep healthy. However when you exercise, your body uses energy and loses nutrients which can result in dehydration and muscle soreness. Christmas is certainly not about dieting. It’s about having fun holiday time with friends and family and indulging in lots of festive, delicious Christmassy food. But we’re all very familiar with the sluggish, bloated and (usually for us) guilty feeling after eating one too many mince pies. We had so much fun last week when we took over Lomax Chelsea for one entire day (yes that meant 6 a.m. to 9 p.m!) for a very special “Mello Monday”. We hate to be tagged as a “fruit juice”- it congers up nasty thoughts of sugar laden, pasteurised juices. Especially given that Mello was conceived by the determination to create something better- a juice that had it all!